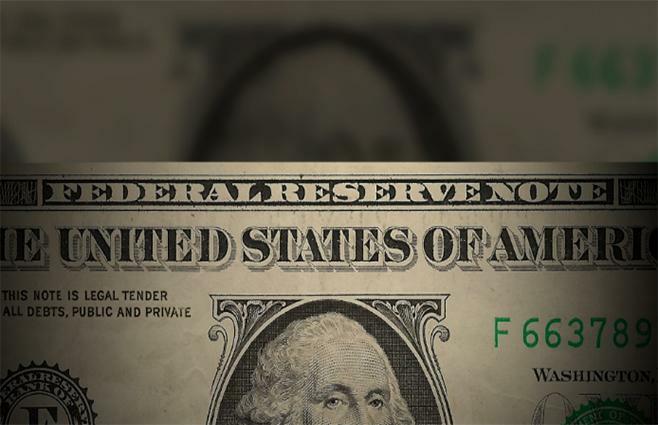 The Federal Reserve has been determined to create “Wealth Effects” throughout the economy since 2008, which has left the majority of Main Street on the sidelines. The Fed’s objective was to make American households feel wealthier by pushing up the valuations of stocks and bonds. However, this paper wealth mentality has worked beautifully for Wall Street and the 1% but has destroyed much of the middle class as wealth inequality continues to skyrocket. In fact, former Federal Reserve Chairman Alan Greenspan has gone on record to warn of a massive bond and stock bubble thanks to historic low-interest rates. I guess, the idea of rising paper wealth to drive a wave of renewed borrowing and spending hasn’t quite worked out as planned. Sadly, as the below chart points out most households have been squeezed as the majority of the wealth created has only gone to the top 5% of households earning in excess of $200,00 annually, meanwhile the bottom 95% have suffered. We used to live in a time where making a six-figure paycheck was a lot of money, but parts of the United States are simply unaffordable for most of middle America. 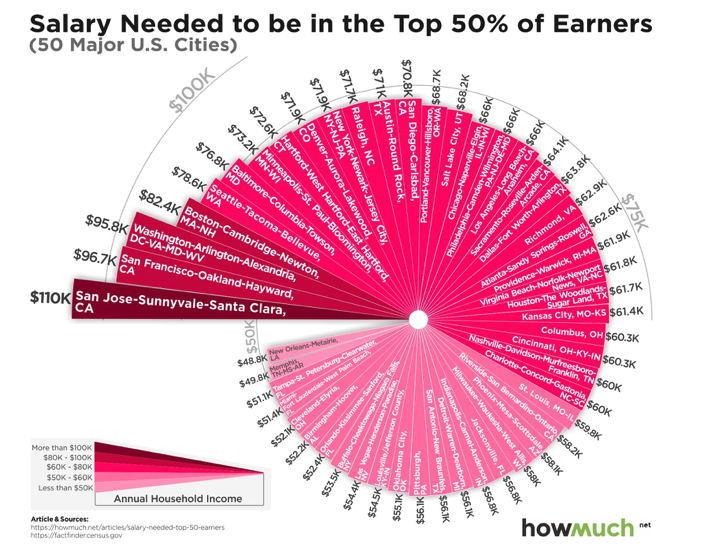 In San Francisco, you have to earn as much as $110,040 to be even considered in the top 50% of earners, according to U.S Census figures. 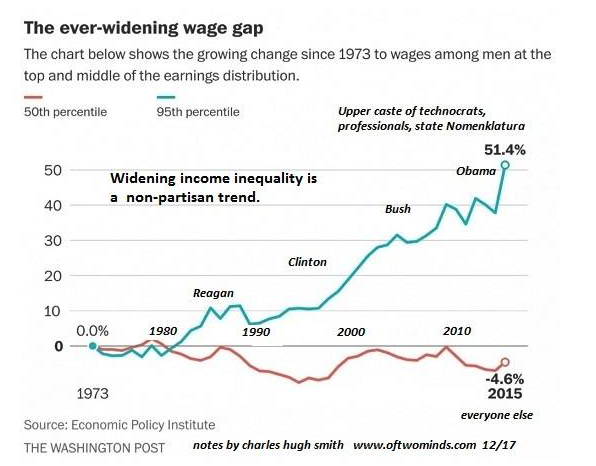 It is evident that these “Wealth Effects” that the central bankers have been chasing does not drive inflation-adjusted wages of the bottom 95% which has stagnated for decades. 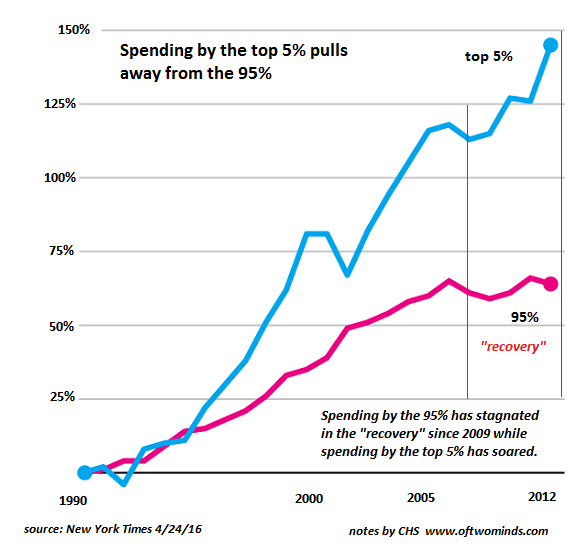 It merely accelerates purchasing power decay where the 1% get the wealth first, and it then trickles down to the rest of the economy. The experiment of prolonged zero interest rates has destroyed savers and rewarded reckless spenders who have helped push household debt to unprecedented levels. Unfortunately, the 2008 Band-Aid is going to be ripped off at some point which will further alienate the middle class and drive wealth and income inequality even further.